I wasn't all that interested in how we cut our cake. With the 71,000 details that I had swimming in my brain, this hit the bottom of the list. I thought about just renting something along with our other dinnerware. We were gifted a be-ribboned knife and server, but it wasn't really our style. We registered for a cake server but, although it had been purchased, we hadn't yet received it by the time of the wedding. During that last week, my mom and I tried to brainstorm something somewhat attractive but very easy that we could use to cut our cake. She went digging in her dining room buffet and found this. 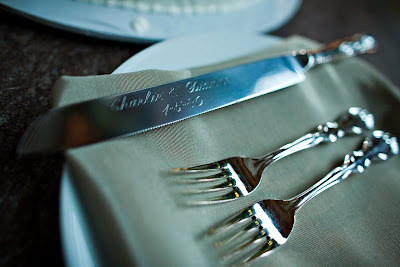 She and my dad had their names and their wedding date engraved on their cake knife. She lent it to me, adding another "old and borrowed" item to our wedding day. Afterwards, we came up with the idea of having Jake and my names and our wedding date engraved into the back. We will use small letters so that my three siblings can do the same. A family heirloom invented, on the spot. That is an amazing idea! I love it! Also, procrastination is a beautiful thing! how sweet! what a great thing to discover at the last minute! I love love love this idea! Sentimental without slipping into mushiness.